Will this damage tree roots? We have a large white pine tree with a lot of poison ivy under it. I've tried pulling it and have gotten poison ivy rashes that required medical attention. Can we spray an herbicide at the weed and not damage tree roots? We also have a lot of trees in the back of our property and we have tried pulling both poison ivy and sumac without success. If we spray the area to clear weeds, are we stressing the 20 some established trees? 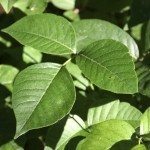 Here is a link to poison ivy control. Herbicides are generally not very effective on poison ivy and the risk to your trees is a concern. A professional application may be needed.